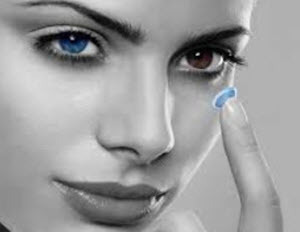 Color contact lenses are used for various cosmetic reasons. Some wearers want to try out a new but natural eye color, e.g. change from blue eyes to brown eyes, while others strive for a less subtle change using colored contact lenses that feature unnatural eye colors, shapes, sizes and patterns. There are also those who use colored contact lenses where the color is similar to their own eye color, e.g. a blue-eyed person using contact lenses displaying a more vibrant blue than the wearer’s natural eye color. Colored contact lenses can also be used to hide eye injuries, congenital eyes problems and other visible imperfections concerning the pupil, the iris and/or the whites. If you want a natural look, keep in mind that natural eyes often feature a spectrum of shades rather than one solid color. Picking a solid color contact lens can make your eyes look unnatural even if you go with a naturally occurring eye color. You can read more about this further down on this page. For more information, please visit our article with tips for naturally looking eyes. Can I use colored lenses even though my vision is perfect? Yes, you can. Contact lenses that doesn’t change the bearer’s vision are known as plano contact lenses. Plano contact lenses are very popular within the field of colored contact lenses. Can I have both color and correction? Yes, corrective colored contact lenses are available. You can purchase colored contact lenses that will correct problems such as myopia (nearsightedness), hyperopia (farsightedness) or astigmatism. This is the opposite of plano contact lenses. Colored corrective contact lenses are usually more expensive than non-colored corrective contact lenses. This is a non-transparent tint that can be used to completely change your eye color, e.g. from dark brown to bright green or from pale blue to deep brown. This category is popular among wearer’s that want to make a major change, including those who want to change into a very unusual eye color or an eye color that doesn’t occur naturally in humans. This is a translucent tint chiefly used to enhance the wearer’s natural eye color. It’s especially popular among wearer’s with naturally light-colored eyes that want to display a more intense eye color while not straying far from their natural look. There are also enhancement tint lenses that will help define the edges around the iris. This is usually a light blue or light green tint added to the lens just to make it easier for the user to see during handling. A contact lens with visibility tint can for instance be easier to locate after it has been accidentally dropped on the floor. The visibility tint is so faint that it is very rare for it to have any noticeable effect on what the wearer’s eyes look like. Sport tint contact lenses are used by athletes to reduce glare, enhance contrast sensitivity and improve depth perception. Lenses can be selected to make certain things more easy to spot. A tennis player can use certain lenses to make the green tennis ball easier for him to spot on the court, and so on. Nowadays, there are companies that will create custom-made colored contact lenses for you to achieve the exact look that you want. This is possible both for corrective and non-corrective contact lenses. If you only wear colored contact lenses on special occasions, daily disposable contact lenses is a convenient choice since you will discard them after use and won’t have to deal with keeping them clean between uses. Why should I get a lens prescription? Even if you live in a country where a lens prescription isn’t mandatory when purchasing contact lenses, getting a lens prescription is still a good idea. If you want corrective colored lenses, you should get a new prescription once a year since our vision changes throughout our lives. Using an old prescription is not a good idea. If you want non-corrective colored lenses but plan on wearing them more than for special occasions, you should still get a prescription since a lens prescription isn’t just about the correction. A prescription will include information about your eyes that will help you order lenses that actually fit your eyes. Well-fitting contact lenses are less likely to cause eye problems or fall out. If you use contact lenses more than just occasionally, you should have your eyes checked once a year to spot any early signs of damage or disease associated with contact lens use. Noticing these problems early on makes it so much easier to prevent them from growing bigger. A lens can easily transmit pathogens. Don’t let anyone else try on your lenses and do not use a lens that has been used by someone else. Most people wouldn’t even contemplate letting someone else try on their corrective lenses, but when it comes to lenses used just for their color…. It might be tempting to check out how you would look wearing your friend’s cool violet colored contact lenses, be we strongly advice against it. It simply not worth the risk of damaging your eyes.